Bamboo is a giant grass. They are perennial grass that has a woody stem. Bamboos are a diverse plant group. They can grow from 1 inch to 100 ft. There are nearly 1500 bamboo species known to humans. Bamboos come in a range of heights, leaf sizes, stem diameters, and stem colors. The best part of growing a Bamboo plant is that it is very adaptive to the climate and grows very fast. In every spring you should expect to see a number of branches keep emerging. In this article, we will share some information on how to grow bamboo plants in your garden. Bamboo is an amazing plant. Here are four reasons why we think bamboos should be in every backyard. First, Bamboo is tropical and has a visual appeal. Second, It is pretty easy to grow bamboo. They can grow under pretty much any condition. Third, to add to the visual noise it has a soothing rustling sound of brushing leaves and clacking canes if there is a bit of breeze. it is peaceful, to say the least. Fourth, You can also use the canes to create useful garden stakes, trellis poles and also beautiful fences. If you are concerned about the invasive nature of the bamboo plants (the widespread negative attribute), let me assure you there are ways to manage it, as you will find out later in this article. 2. Running types or Spreading types of bamboos. Though all bamboos spread by rhizomes or underground stems (like that in Ginger), Clumping types of bamboo plants spread much slower compared to the running types as they have much shorter rhizomes. They basically stay together. Running types of bamboos, on the other hand, produce long, vigorous rhizomes. These are responsible for invading adjacent areas, especially those that are fertile and irrigated properly. They can travel up to 100 feet before sprouting. It is always advisable to grow clumping bamboo. If you are growing clumping bamboos then you don’t need to worry too much. They are easier to manage in the landscape. However, If you have running types in your garden don’t panic, you can still use root barriers to protect the rest of your garden from extensive bamboo growth. As a general rule, a root barrier should be at least 30 inches deep and 4 inches above the ground. You can use fiberglass sheets or high-density polypropylene for most effective, long-lasting barriers in groves. But you need yearly maintenance and inspection to make sure that the bamboo root system didn’t fool you. It is always better to plan groves for future growth potential as any bamboo plant can spread to cover as much as 50 square feet in 5 to 10 years. Fernleaf (They can reach up to a height of 20 feet and have 0.5-inch diameter). Chinese Mountain (Has leaves that can be up to a foot long). Umbrella bamboo (Fargesia murieliae. Can reach up to 15 feet with a diameter of 0.5 inches). Purchase your plant material from a reputable dealer selling bamboo that has been correctly identified to species and cultivar. If you are planning to grow bamboo commercially make arrangements with one or more wholesale nurseries well in advance of the intended planting date. 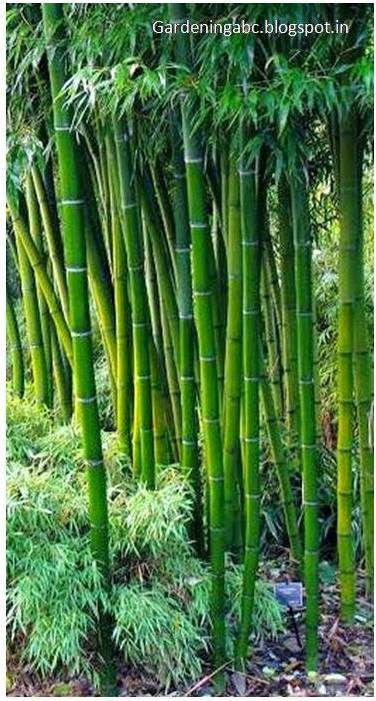 Bamboo grows well in slightly acidic and loamy soil with a good drainage capacity and enough organic materials. But don’t worry if you don’t have that kind of Ideal environment at your disposal. Bamboo is one of the plants that will grow in almost any soil type. Just make sure that it has a good drainage capacity and you will have a lashing bamboo garden in a very short time. You can increase the drainage capacity of your soil by adding some soilless growing media to your soil. Due to the infrequency of flowering and the scarcity of available seed, we generally don’t grow bamboo from seeds. You can choose transplants or rhizome cuttings for growing bamboo. Before planting, Bamboo rhizomes make sure some leafy shoots are attached to it. This will increase your success rate with bamboo. You can harvest transplants from the established bamboo stalks using the proper tools, but it can be labor intensive. It is best to transplant bamboo in the warm season. For running bamboos, use a sharpened shovel and a pair of hand pruners, dig and separate a clump that has white roots, a green top, and several joints on the rhizomes. Keep the rootball moist and replant as soon as possible. Do not leave plants lying horizontal for more than a few minutes. This will cause injury to the transplant. Best time to plant them is in the springs. While planting, it is important to protect the bamboo plant from the very hot sun especially if your plant is very small in size. Space them not less than 5 feet if you plan to form it dense. For some species, you may require giving much more space. In case you are planning to plant a taller one, use some support to hold the plant. Sometimes a strong wind can damage or even uproot the plant; so be careful. In terms of water use, bamboo does require some irrigation to establish, but it can tolerate much less frequent irrigation once established. Newly planted bamboos required frequent watering. You need to take care of your new transplant for up to 2 years. Use organic mulch to cover the area. Mulching will help in water retention, weed protection and being of organic materials it will enrich the soil. Though in most of the cases bamboo plants take nutrients from the soil itself it is better to provide some fertilizers. Like other warm season grasses, it will respond favorably to nitrogen fertilization during the growing season. Use compost for fertilization but focus on the ingredients which are more enriched with nitrogen (N). If you want to know more about the composting ingredients check out our earlier article. It generally takes 5 to 6 years for a bamboo plant to mature. You can really give your desired shape by a little bit of pruning. Cut just above the node. Depending on the size of the branch you want to prune use a chainsaw or a simple knife. There is very little chance that you can damage the plant by pruning. So don’t be hesitant. Sometimes people feel very concerned about yellowing or loss of leaves of their bamboo plant, but it is a common phenomenon and the degree varies from species to species. They are evergreen plants and grow a complete set of new leaves each spring. The old ones fall away as the new ones develop at their places. The best way to use bamboo leaves is to leave the leaves in place and use them as mulch. Bamboo is a forest plant and the natural mulch of dead leaves would help keep the soil moist and would recycle nutrients. Bamboo only flowers every 50 years or more, so they usually propagate by division. They exhibit mass flowering, i.e, they grow all flowers at the same time. You can use the culms as woods after they are 3 to 5 years old. Cut the canes close to the ground either in late winter prior to the shoot emergence or in summer after harvesting the shoots. The branched tops, are not used as timber. You can use them by feeding them to livestock or shredding them for mulch. You can also harvest edible shoots. Start harvesting the moment you find tips are emerging from the soil. They grow rapidly and can quickly become tough so you need to act fast. Cut the shoots by hand below ground at the point of rhizome attachment. Wash the harvested shoots properly, and store them for off-season uses. Do not plant running bamboos near riparian areas, irrigated fields, or other regularly irrigated areas such lawns. Running species will eventually get around the best of barriers. Running bamboos are useful in ground stabilization and erosion control. Hope you enjoyed the article if you have any questions or suggestions please leave it in the comment box below. If you liked the article please consider sharing with others.